‘Part one’ described a very impressive application of Open Space Technology for community consultation on the subject of mental health. Chatting with participants at the forum, it seemed I was one of a relatively small group of people in the room who was not a ‘consumer’ of mental health services or a ‘mental health professional’. This really drove home a strong sense of the market forces at play in the mental health system, where a large industry has grown up to service consumer needs. A lot of people in the room directly or indirectly derived their living by servicing the needs of mental health consumers. In fact, according to the latest available figures from the Australian Institute of Health and Welfare, in 2004–5 Australia allocated $52.7 billion recurrent expenditure to health, of which $4.1 billion (8%) was allocated to treating mental disorders. Clearly, these figures are woefully out of date. In the election campaign the major parties have been offering between $277 million and $1.5 billion for mental health. in 2009-10, resources available to the Australian Defence portfolio totalled just under $43 billion. 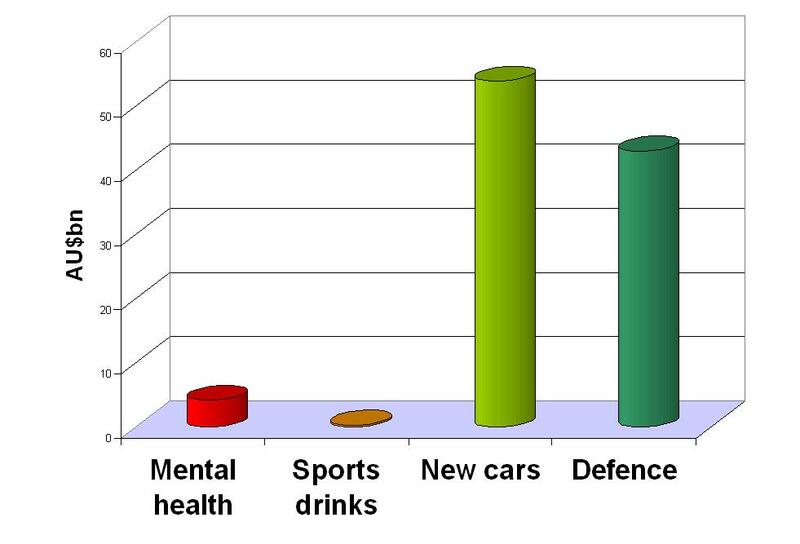 No doubt some of us will be disappointed to know Australia spends ten times more on cars or war than on mental health. Even so, we’re talking about a fairly substantial industry. Another earlier post touched in a very brief, tangential way, on the idea that organisations have an inherent tendency to self-perpetuation. This is just one of the ways organisations can mimic the characteristics of living organisms and ecosystems, because all three are complex adaptive systems. This may seem childishly self-evident. An organisation is a group of people with a common goal. Individuals choose to work within an organisation because they receive various incentives or rewards (in the form of job satisfaction, money, status, friendships, etc). This means they all have a motivation to exercise their collective imagination, effort and desire, willing the organisation to remain in existence, so they can continue receiving those rewards. sometimes this tendency towards self-perpetuation can produce interesting side-effects. Well, looking at this little microcosmic market of 250 mental health suppliers and consumers brought to mind an anecdote, purportedly from the work of John Grinder and Richard Bandler, co-inventors of Neurolinguistic Programming (or NLP). The story was passed on a long time ago and is now sadly lacking details or citations, but the essence was a conversation with a professional psychologist who ran a successful private practice, and who also provided pro-bono counselling to inmates at a local prison. The psychologist was trying to figure out why he seemed to be able to effectively treat his prisoners in around 12 sessions, but many of his private clients required much longer treatments, sometimes 20 or more sessions. It had never occurred to him that, just possibly, he might be motivated to keep his paying clients coming back a bit longer than his non-paying clients. This story poses an important question: are there structural incentives within the health system to keep treating symptoms, rather than curing or, better still, preventing illness occurring in the first place? Or, to turn this idea upside down: wouldn’t it be wonderful if everybody was so mentally healthy and so well-adjusted that we didn’t need a mental health profession any more? Wouldn’t it be great if all the very smart, switched-on health professionals in the room could harness their collective imagination, will-power, ingenuity and passion to completely cure all mental illness and make themselves unemployed? So I wrote this idea on a piece of butchers’ paper, and stuck it up in the marketplace to see if anyone else wanted to come and talk about it. This entry was posted in Decreasing costs, Positioning for the future, Quality, Two-way communication and tagged community consultation, complex adaptive systems, incentive, market forces, mental health, motivation, Open Space, supply and demand, wellness. Bookmark the permalink.